For a parent, there is nothing more humbling than understanding that God has entrusted us with the care of his precious little ones. Nothing in life makes us realize the enormity of our responsibility as well as the reality of our inability as when our newborn is first placed in our arms. It is the most incredible moment and the scariest moment. On our wedding day, the priest asks us if we agree to receive children lovingly from God. Of course, we respond with an enthusiastic “yes” but at the time, we don’t really have any idea what we have agreed to. When we become parents, we finally understand what it means to protect our family from physical, emotional and spiritual harm and how immense is the call to be a domestic church. By the grace of God, my husband and I have tried to establish a home that is God-centered; a place where our family can come to know and love our Faith so that we can be equipped to discern right from wrong and be ready to take our place in the world. In our human frailty, we are limited in our ability to protect and prepare our children for their future but regardless of our shortcomings, we knew that we needed to do more. Gird our family for battle. We decided to enthrone the Sacred Heart of Jesus in our family. My husband and I couldn’t ask for anything more for our family so on a recent Saturday evening, with the help of a friend who is a priest, we gathered together at home for the ceremony. Kneeling around our living-room coffee table which had been turned into an altar for the ceremony, we placed a new statue of the Sacred Heart of Jesus surrounded by a bouquet of roses and candles. Father and my husband led us in the prayers of reparation, consecration and thanksgiving. May our home be for Thee a haven as sweet as that of Bethany, where Thou canst find rest in the midst of loving friends, who like Mary have chosen the better part in the loving intimacy of Thy Heart! May this home be for Thee, O beloved Savior, a humble but hospitable refuge during the exile imposed on Thee by Thine enemies…. Jesus told Mother Rafols of the mother house of the Sacred Heart in Saragoza, Spain, that His Sacred Heart is hurt when souls who are consecrated to Him forget, offend and despise Him. God forbid that our family should treat the Lord in that way and so as part of our evening prayer, we pray the short Renewal of the Consecration of the Family. Enthroning the Sacred Heart is not a guarantee that evil and temptation will not attempt to destroy our family. That would be unrealistic. 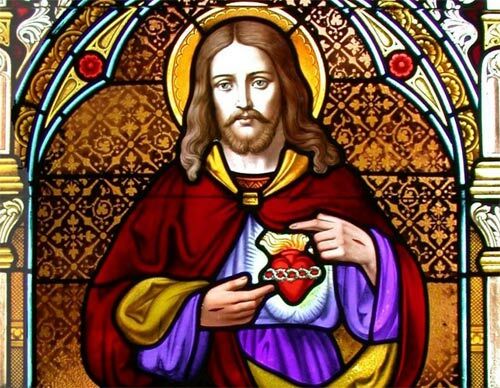 Our hope and confidence lies in the assurance of graces obtained from the Sacred Heart of Jesus; the graces that will give our family what we need to live out our Catholic Faith in a secular world. 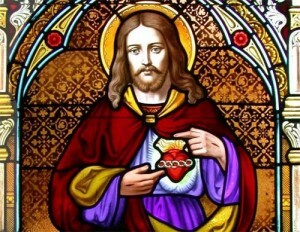 June is dedicated to the Sacred Heart of Jesus. If you haven’t already done so, I invite you to enthrone the Sacred Heart of Jesus in your home. You will have the assurance of knowing that, by God’s grace, you have helped to strengthen and protect your family in their walk with God.